Jane Austen’s Pride and Prejudice is interpreted by the Italian illustrator Sicks. 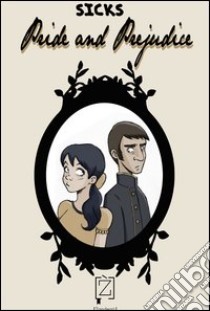 This graphic novel is the first English ebook released by Zandegù. It belongs to the series I Bignè, our super-short graphic synopsis of famous classic novels in a funny ebook version. In order to celebrate the 200th anniversary of Pride and Prejudice since its first release in 1813, Sicks - an illustrator and painter based in Rome, graduated from the ‘Scuola Internazionale di Comics’– revisits the story in an ironic way, with a sepia look and a feminine and yet modern touch. The novel tells about a cutting edge love story: proud Elizabeth Bennet falls in love with biased Mr. Darcy. Or is it the other way around? Unforgettable and funny characters, a lot of solidarity between the Bennet girls and lots of L-O-V-E. Pride and Prejudice is one of the most reinterpreted novels of the past few years: movies, zombies… and now Zandegù publishes the first graphic novel ‘made in Italy’ of Pride and Prejudice!